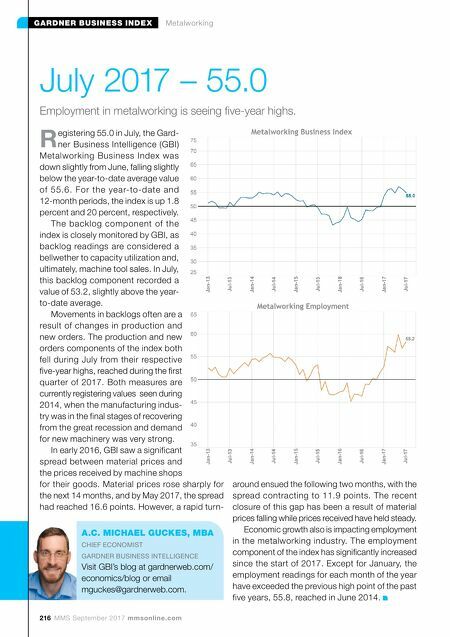 216 MMS September 2017 mmsonline.com GARDNER BUSINESS INDEX Metalworking July 2017 – 55.0 A.C. MICHAEL GUCKES, MBA CHIEF ECONOMIST GARDNER BUSINESS INTELLIGENCE Visit GBI's blog at gardnerweb.com/ economics/blog or email mguckes@gardnerweb.com. Employment in metalworking is seeing five-year highs. R egistering 55.0 in July, the Gard- ner Business Intelligence (GBI) Metalworking Business Index was down slightly from June, falling slightly below the year-to-date average value of 55.6. For the year-to-date and 12-month periods, the index is up 1.8 percent and 20 percent, respectively. The backlog component of the index is closely monitored by GBI, as backlog readings are considered a bellwether to capacity utilization and, ultimately, machine tool sales. In July, this backlog component recorded a value of 53.2, slightly above the year- to-date average. Movements in backlogs often are a result of changes in production and new orders. The production and new orders components of the index both fell during July from their respective five-year highs, reached during the first quarter of 2017. Both measures are currently registering values seen during 2014, when the manufacturing indus- try was in the final stages of recovering from the great recession and demand for new machinery was very strong. In early 2016, GBI saw a significant spread between material prices and the prices received by machine shops for their goods. Material prices rose sharply for the next 14 months, and by May 2017, the spread had reached 16.6 points. However, a rapid turn- around ensued the following two months, with the spread contracting to 11.9 points. The recent closure of this gap has been a result of material prices falling while prices received have held steady. 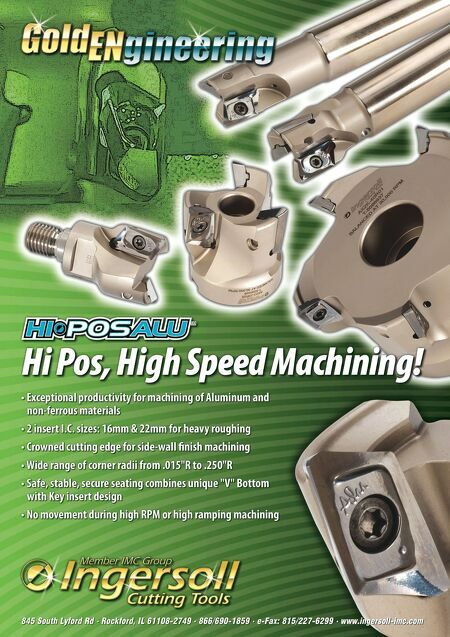 Economic growth also is impacting employment in the metalworking industry. The employment component of the index has significantly increased since the start of 2017. Except for January, the employment readings for each month of the year have exceeded the previous high point of the past five years, 55.8, reached in June 2014.